Toronto Custom Concept’s lead designer, Brittany Oakley, is a skilled award-winning designer who has a high attention to detail in all of her designs and renderings. We highly recommend to all of our clients to consider discussing your project with Brittany as you are planning out your next home or business renovation project. Brittany has her formal diploma of Interior Design from The Art Institute of Vancouver, BC. Brittany comes with a wide range of client experiences in designing home, retail and commercial floor plans, including millwork drafting of kitchens and cabinetry, 3D colour based renderings. She is an expert in various software packages such as AutoCAD, SketchUp, and Illustrator just to name a few. 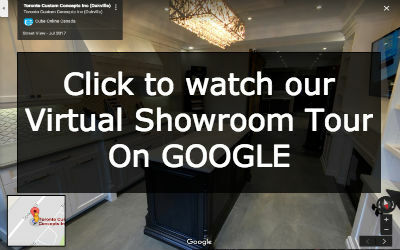 She can work with you to come up with a design and floorplan, with elevations, and millwork plans directly out of our Oakville Showroom location on Speers Road. You can bring in 4 or 5 pictures of designs that you like from different sources such as Instagram, Pinterest, Houzz, or even magazine cut-outs for pictures to provide inspiration for your new renovation design project! 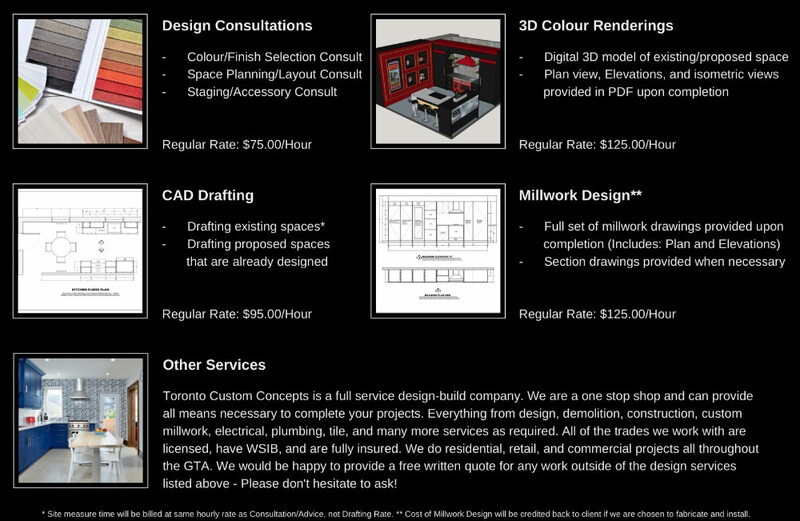 At Toronto Custom Concepts, our design team can work with you from beginning to end to tailor the right layout and design to suit your tastes and usability needs. Our design team can also partner with you on various stages of your renovation project including idea generation, planning, layout design, usability assessments and designing of walk-thru diagrams for your space. 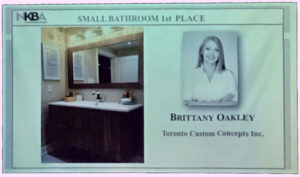 Brittany’s design resume includes being nominated for multiple design awards while at Toronto Custom Concepts. 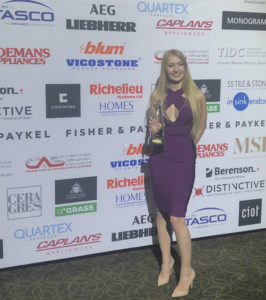 She has most recently been recognized at this year’s National Kitchen & Bath Association (NKBA) Awards for the Ontario Chapter for her outstanding design work. Brittany also won the 1st place trophy for best design in a bathroom category at this year NKBA Awards Gala. So you know you are in good hands working with Brittany and the design team at Toronto Custom Concepts. 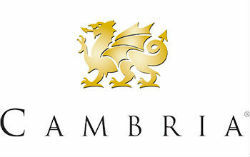 Come in and talk to us about your project design today! The TCC Referral Program has a broad network of interior designers, interior decorators, home stagers and real estate professionals taking advantage of this program to expand on their clients renovation needs. Our referral partners typically pull us into a single client engagement project and once they see how we manage all aspects of the renovation including project management. The Referral Program works whereby if you refer and partner with us so that we can provide home renovation services to your client on net new referral business, TCC will gladly provide the referring partner a 5% referral fee on the renovation service amount. Contact us for more information! Call us today at 416-806-2232 to get started!